Alexis Faust has been appointed the new Executive Director of the Aullwood Audubon Center and Farm. http://aimmedianetwork.com/wp-content/uploads/sites/19/2015/07/web1_Alexis_Faust_Photo3.jpegAlexis Faust has been appointed the new Executive Director of the Aullwood Audubon Center and Farm. 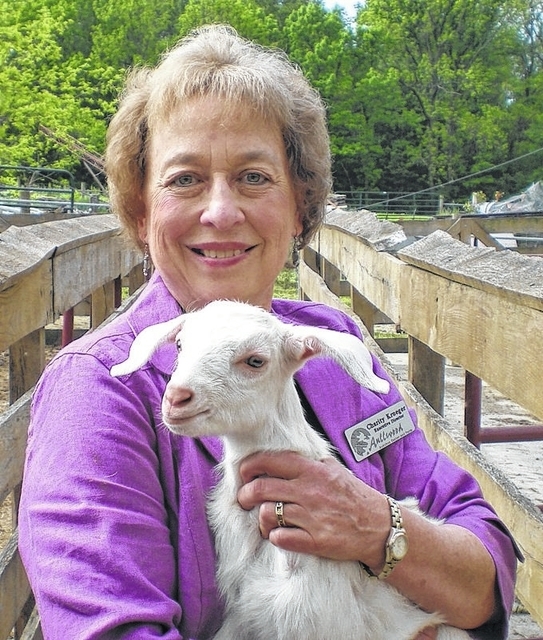 Charity Krueger is retiring as the Executive Director of the Aullwood Audubon Center and Farm after 33 years. http://aimmedianetwork.com/wp-content/uploads/sites/19/2015/07/web1_Charity_-Krueger_20123.jpegCharity Krueger is retiring as the Executive Director of the Aullwood Audubon Center and Farm after 33 years. http://aimmedianetwork.com/wp-content/uploads/sites/19/2015/07/web1_Charity13.jpgCharity Krueger is retiring as the Executive Director of the Aullwood Audubon Center and Farm after 33 years. http://aimmedianetwork.com/wp-content/uploads/sites/19/2015/07/web1_Charity33.jpgCharity Krueger is retiring as the Executive Director of the Aullwood Audubon Center and Farm after 33 years. http://aimmedianetwork.com/wp-content/uploads/sites/19/2015/07/web1_Charity43.jpgCharity Krueger is retiring as the Executive Director of the Aullwood Audubon Center and Farm after 33 years. BUTLER TOWNSHIP — Alexis Faust has been appointed to be the new Executive Director of Aullwood Audubon Center and Farm. The announcement was made in a joint press release issued by The Friends of Aullwood Board and the National Audubon Society. Faust takes over for Charity Krueger who will retire on August 3 after leading the nature preserve for 33 years. Faust comes to Aullwood after serving as the President and CEO of Taltree Arboretum and Gardens in Valparaiso, Indiana. While there the increased visitation by more than threefold, began a capital campaign, and funded other innovative work including Children’s Adventure Garden that focused on farm-to-table values, including breeding endangered heritage farm animals. Prior to that, she led the planning for a massive science center in Tucson, Arizona. Faust will begin her role at Aullwood on July 1, working with Krueger and other staff members on transition elements and becoming acquainted with volunteer leaders and supporters in the Dayton community and surrounding region. Krueger leaves Aullwood in a much better place than when she assumed the position 33 years ago. Under her guidance, the Center has been self-supporting since 1986 and has had a balanced budget in every year since. • Sharing environmental messages through mass media in a weekly half-page education series (Our Earth A-Z) designed for children, teachers and adults. This series was syndicated to newspapers in 18 states – reaching millions of readers during its two year publishing history. • An international conservation initiative, Earth No Boundaries, focused attention on the need to preserve habitats in North and Central America for neo-tropical migrant birds. A Spanish/English bilingual conservation program was implemented, touching the lives of 5,000 children and adults through a cross-cultural exchange with four countries –USA (Ohio), Canada, Honduras and Guatemala. • Aullwood’s innovative partnership with the Dayton International Airport converted 125-acres of airport land into the Paul E. Knoop Jr. Prairie Preserve, to attract threatened grassland birds. This year a 270-acre prairie will be planted. Aullwood staff and volunteers will conduct studies to determine if prairie habitats that attract small birds will reduce bird strike incidents with planes. If documented, airports across the country may convert turf and agriculture lands into prairie habitats for some of our most threatened songbirds. • Capital campaigns for Aullwood tripled the size of the Marie S. Aull Education Center, created the accessible Birds, Flight and the Wrights Trail, renovated the entire farm complex, tripled Aullwood’s endowments and created a new Farm Discovery Center and the Wyse Family Pavilion. • Education initiatives to meet the needs of at-risk youth resulted in the creation of stellar programs such as the Aullwood Adventures School Program, Aullwood REACHES (Real Experiences Arouse Curiosity, Helping Everyone Succeed), Aullwood READS (Resources for Earth and Agriculture Discovered and Shared) and STEMing Science into Conservation Action. Creating the first Nature and Farm Head Start Preschool in the country that is located on a working farm.